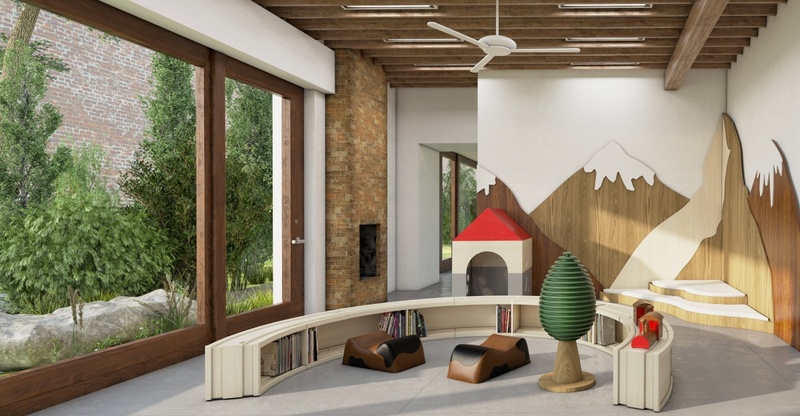 The conceptual design for the Swiss Daycare in Brooklyn, New York is inspired by the Swiss Alps. The four classes for the different age groups are defined by varying themes. The Alpine mountains and their strong cultural identity is a major source of inspiration for the bilingual Swiss Daycare. Originally built as a candy factory, which later became the residence and studio of the notable American artist, Jennifer Bartlett, the daycare's design drew its inspiration from the history of the site and the artist's unique abstract language. The geometric forms and familiar objects represent American homescape, such as basic icons of a house and a tree, serving as recurring theme in all of the classes.